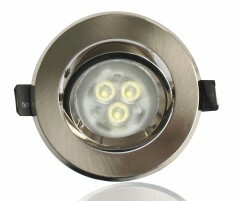 This Aluminum MR16 Recessed Fixture avaialble in a Brushed Nickel or White Finish and includes a MR16 standard socket. Rotating eye to focus the light where it's needed. The MR16 installs from the back of the fixture giving it a clean finished look. 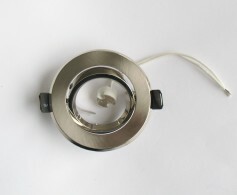 Springs hold this fixture in place snug in a 3" diameter cut out hole or 3" recessed Can Fixture. This is an easy to install Low Voltage Lighting fixture that's lightweight and built to quality standards and visual appeal. Excellent for use with the GBL MR16 Power LED product line or with GBL Round07 LED Line.